You are here: Home / Albemarle / What, Pray Tell, IS the Character of the Area Surrounding the Shops at Stonefield? What, Pray Tell, IS the Character of the Area Surrounding the Shops at Stonefield? 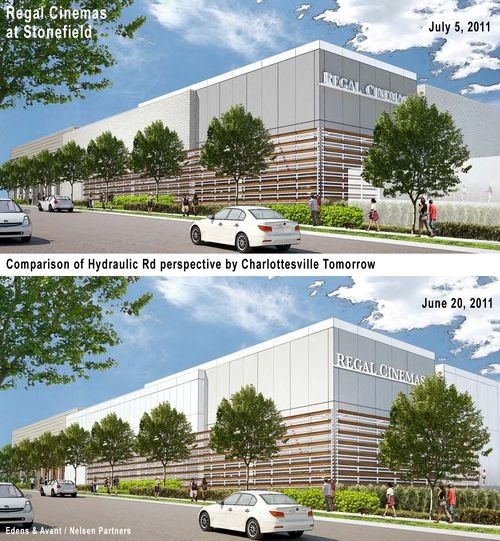 Charlottesville Tomorrow has been tracking the Shops at Stonefield’s saga. Albemarle’s Architectural Review Board is in a bit of an unenviable position, but let’s be serious. The Shops at Stonefield are going to be big, likely going to be ugly, will probably look like almost any other big box development in the US, and will represent a huge step towards homogeneity in Charlottesville/Albemarle. 1. The goal of the regulation of the design of development within the designated Entrance Corridors is to insure that new development within the corridors reflects the traditional architecture of the area. Therefore, it is the purpose of ARB review and of these Guidelines, that proposed development within the designated Entrance Corridors reflect elements of design characteristic of the significant historical landmarks, buildings, and structures of the Charlottesville and Albemarle area, and to promote orderly and attractive development within these corridors. 5. It is also an important objective of the Guidelines to establish a pattern of compatible architectural characteristics throughout the Entrance Corridor in order to achieve unity and coherence. Building designs should demonstrate sensitivity to other nearby structures within the Entrance Corridor. Where a designated corridor is substantially developed, these Guidelines require striking a careful balance between harmonizing new development with the existing character of the corridor and achieving compatibility with the significant historic sites in the area. Maybe they’re operating under guidelines different than the ones I was able to find. Seminole Square mall – Cheeseburger in Paradise, the Express Car Wash, Chili’s, strip with Sprint and the UPS Store, on the east side of 29, Burger King, and lots of parking lots. Stonefield is replacing the old Blockbuster and 7-11, and lots of trees and natural landscape. Continue south on 29 and you’re met with KFC and Best Buy. How exactly can a big box development work under these guidelines? 9. Building forms and features, including roofs, windows, doors, materials, colors and textures should be compatible with the forms and features of the significant historic buildings in the area, exemplified by (but not limited to) the buildings described in Appendix A. The standard of compatibility can be met through scale, materials, and forms which may be embodied in architecture which is contemporary as well as traditional. The replication of important historic sites in Albemarle County is not the objective of these guidelines. 10. Buildings should relate to their site and the surrounding context of buildings. 11. The overall design of buildings should have human scale. Scale should be integral to the building and site design. 12. Architecture proposed within the Entrance Corridor should use forms, shapes, scale, and materials to create a cohesive whole.